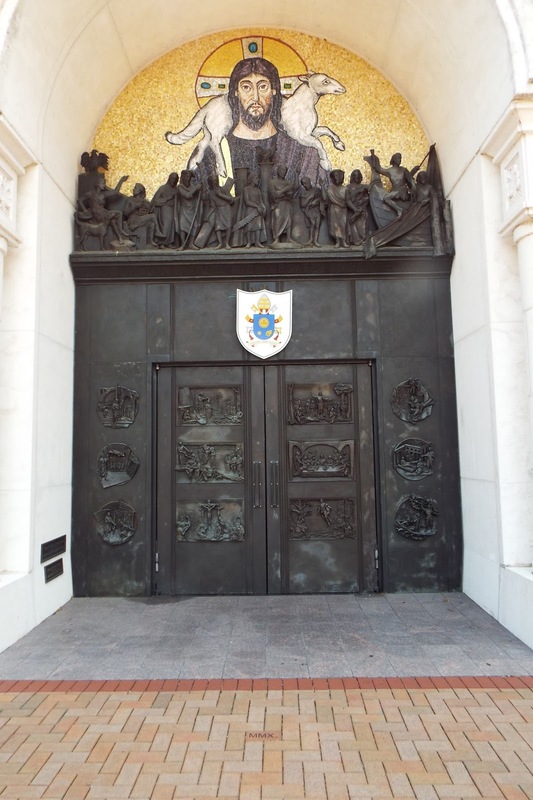 Holy Door of Mercy Mary Queen of the Universe National Shrine, Orlando, Florida. Yesterday I was blessed to visit this beautiful shrine of Our Lady. As I have mentioned in previous posts I been visiting my dear friend in Orlando and I had asked her how close the shrine was to her. Dottie had never been to the shrine herself and was happy to take me there. I was anxious to first visit the shrine and then to walk through the Door of Mercy located there. The doors to the basilica are beautifully carved. They depict scenes from the life of Christ, Mary and tell stories from the Old Testament. Catholic churches around the world have been designated to have special doors denoted as Doors of Mercy during this Extraordinary Year of Mercy in the church and are pilgrimage sites for the faithful. Confession is offered daily and Mass is said twice daily. I met the most wonderful priest, Fr. Richard Tuttle. He is a retired professor from Franciscan University of Steubenville. After hearing my confession we sat and talked for quite a while. Whenever I visit a shrine I usually obtain a rosary from the gift shop. I finally got my Irish rosary and stopped back to have Fr. Tuttle bless it for me. I came away with the most wonderful peaceful feeling I have ever felt.